RadioShack hooked a Gizmodo reader up with a free trip to Chicago to take in the sights, sounds, and slovenliness of the grandaddy of music festivals, Lollapalooza. Reader Mike was chosen to rep Gizmodo and below are a series of missives from the field that were filed using an assortment of incredible gadgets supplied by RadioShack. Warning: jealousy may ensue. Mike gets settled in the big city, rides the VIP shuttle, checks out Chow-Town, and catches Collie Buddz, Mountain Goats, Skrillex, and Coldplay. Read his Day One recap here. Mike's accomplice Ricky even surprised a sad ticketless couple with free 3-day passes to Lolla, courtesy of RadioShack. Segway tour of Chicago in the a.m., Black Lips in the afternoon, and Eminem at night — just a typical day for Mike. 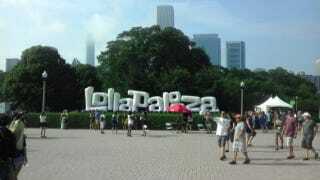 Well, a typical Lollapalooza day. Read his Day Two recap here. Downpour! But our man Mike didn't let a little mud keep him from seeing the Foo Fighters. Read his Day Three recap here. Mike is still coming down from his experience at Lolla — check out all the tweets, posts, videos and more @RadioShackLive. And make sure you follow @RadioShackLIVE for details on future events, including how you could be the next correspondent.